Who knew that Charleston actually had a winter?! I sure didn't haha! We survived the snow storm (we got about six inches), and I am now officially ready for spring! Although it is still really cold here, I have spring on my mind (hello spring fever) and want to start wearing my spring clothes! 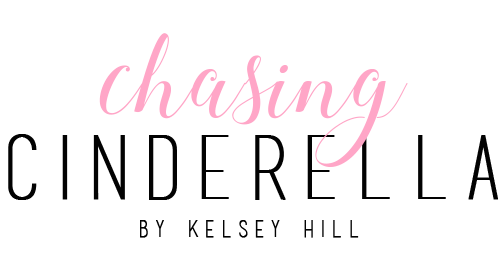 If you're in the same boat as I am, don't fret because I am here to show you an easy way to style your spring dresses for winter! 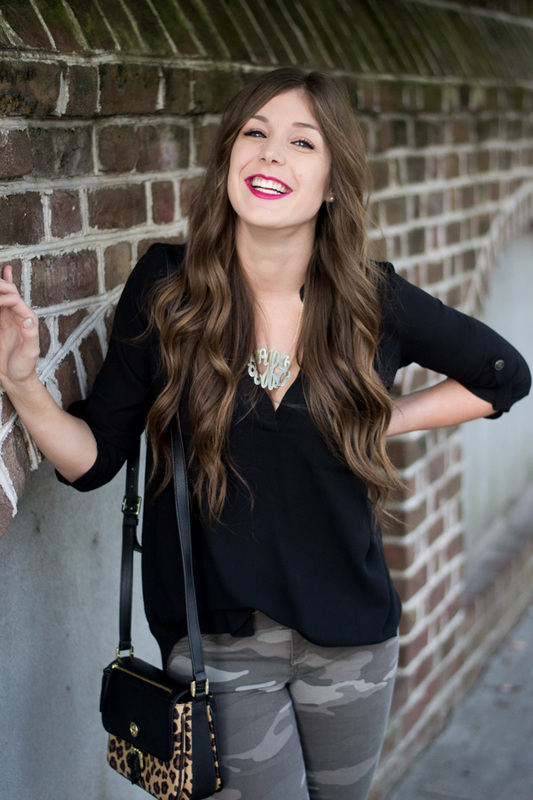 This post probably won't tell you anything you don't already know, but I do know that it's always easier to style an outfit when you have some inspiration to look at! 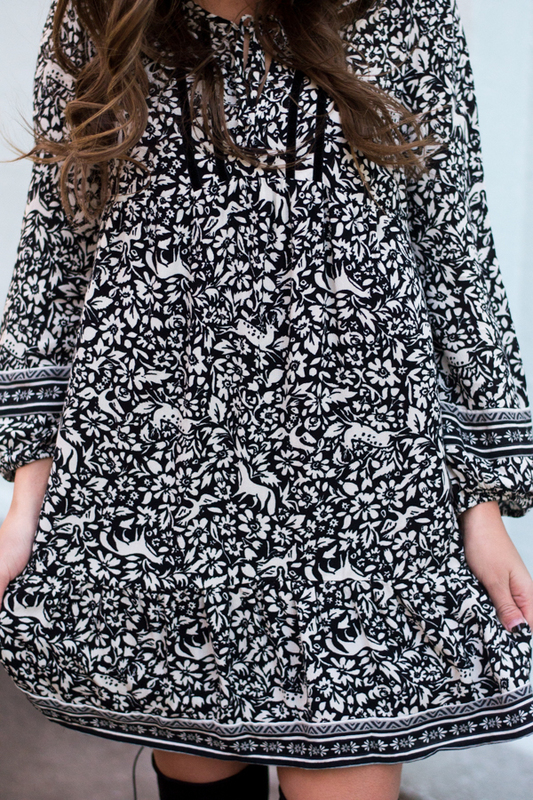 I styled this super cute spring dress (do you see the deer on it?! This dress is definitely Cab approved haha) with a pair of over-the-knee boots and a leather jacket. 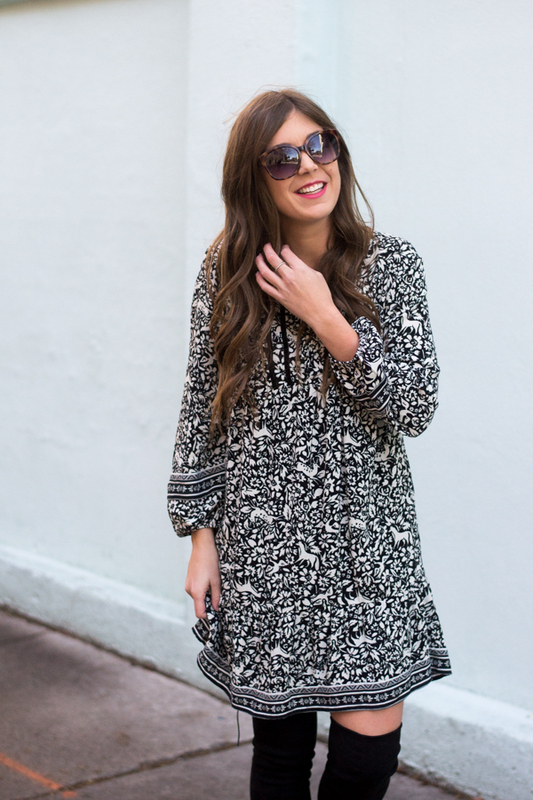 The easy addition of these two items completely transform this spring dress to a winter one! 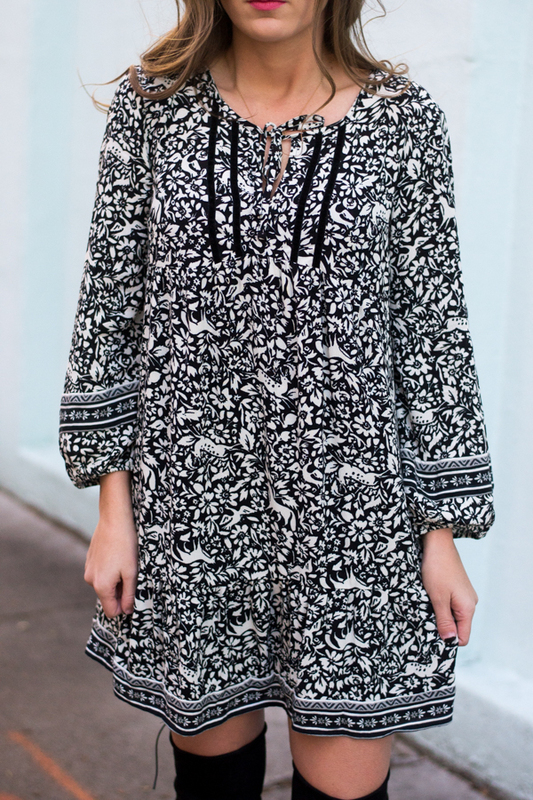 Once spring gets here, I will probably style this dress a few different ways. (Yes, you will definitely see me wearing this more than once. I'm an outfit repeater!). I will probably style it with a pair of black flats for work, with a pair of white sneaks for a trip downtown, even a pair of sandals for the warmer Charleston spring days! Love it! Black and white are my colors! This is super cute! I need to find more ways like this to mix my seasonal fashions more. This dress is so dang cute!! Love it paired with the moto jacket for this cooler weather! Cute dress! love it with the jacket! I love this idea! Granted here the idea of going without tights or pants makes me cold, but come Spring this would be an ideal city look! Love the jacket and the boots. You styled this dress perfectly! I love that the black and white goes through all seasons! This is perfect! OTK boots are so in and so cute! I am a huge fan of going without tights/hose. 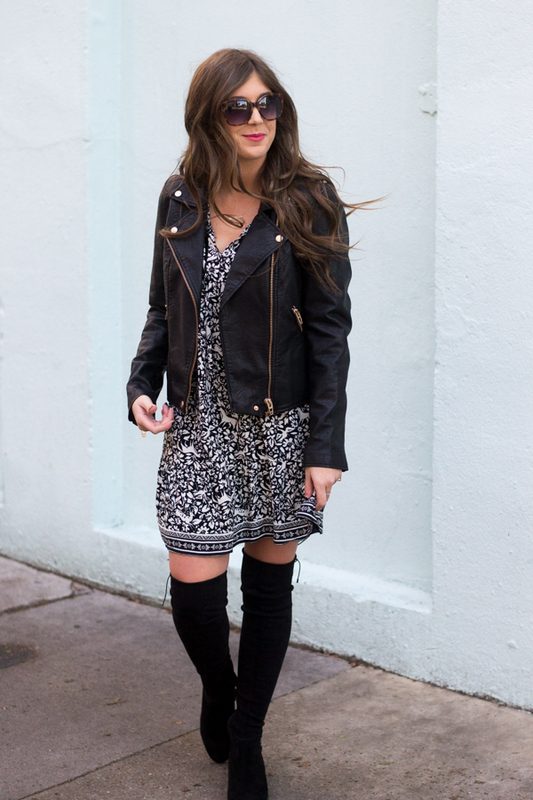 This dress with the boots & leather jacket is perfect!! I love this outfit, that dress is so pretty and I love that you styled it for winter! I for sure have Spring on my mind after it being 15 degrees today! 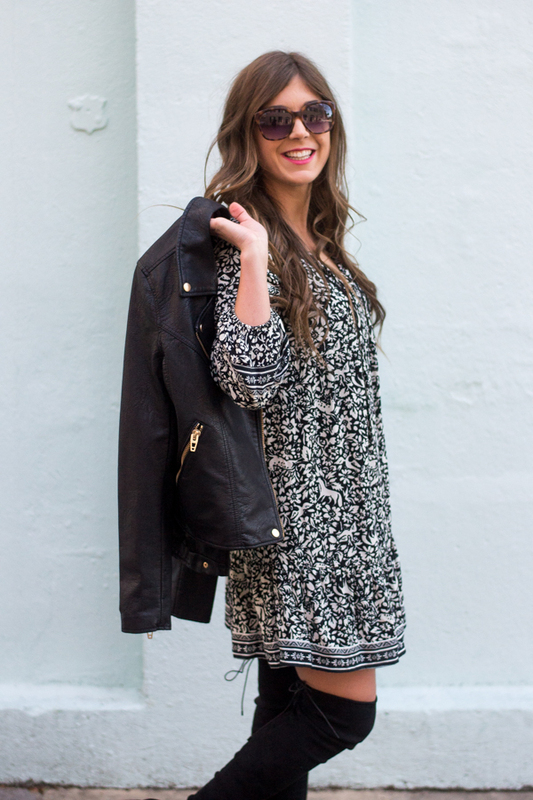 You nailed this transitional look! 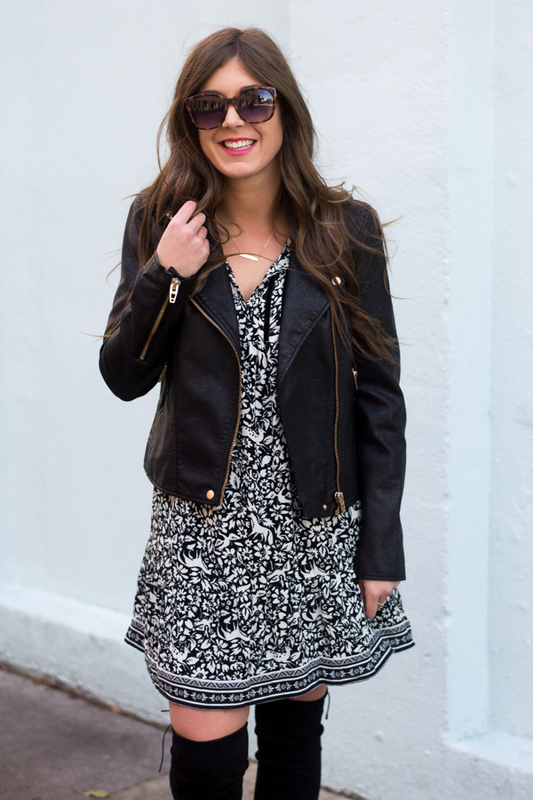 I love the black and white dress and how you wore it with the jacket and boots. In this kind of cold, I might even add tights and a scarf haha! You always have the cutest style. Such a great idea, especially since I live in Texas. Love how you pair these all together. Such a cute outfit, girl! I didn't even think spring when I saw this! Loving the dress with the boots. So chic.